Premier Decorations Parcels features a charming set of 3 different size Christmas parcels features a red mesh covering with dots of silver foil decoration and a silver mesh bow providing sparkling festive light. These parcels are perfect for carrying on the Christmas themed colours throughout the house. 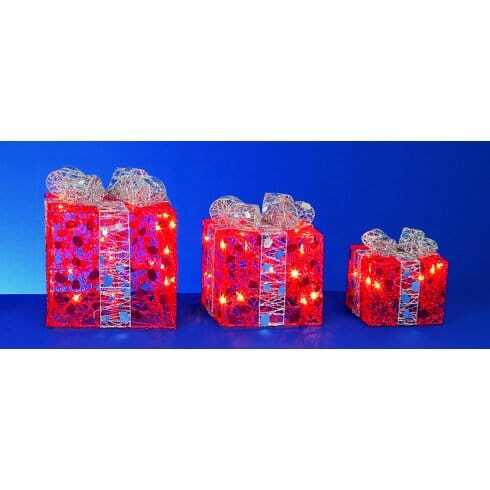 The product code for this set of 3 Premier Decorations parcels is LI112042R. The parcels are illuminated throughout with 40 clear fairy lights creating a magical display of illumination making them an ideal addition to your Christmas decorations. Suitable for indoor use only, all 3 parcels are wired together and operate from a single plug point. 4 spare bulbs are included. Also available in gold parcels with red bows or silver parcels with black bow's which can be ordered from our website.